Amongst the most popular cities of the world, London stands out for its pomp and grandeur. At the time of my visit, the country was going through a very bad economic patch. 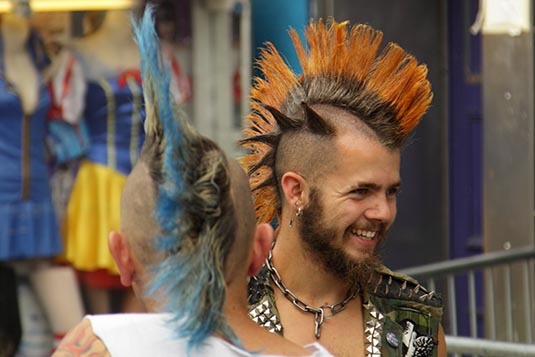 But that hasn’t slowed down the vibrancy of the city. As they say, the show must go on… long live the Queen. November is certainly not the best of the months to be in London. The sun hardly shows up (like most of the other months); it gets dark at about 5 in the evening and adding to the chill & gloom are the occasional showers. But I had no option. The World Travel Market, an important trade fair for us, happens only in November. To folks in the travel industry, it’s a pilgrimage – a must do! So there I was trying to gather and do as much as possible with the little spare time on hand. Even weekend is not a good idea to land in London. Invariably London’s underground train system would be down for one of the two reasons – repairs or a strike. Sure enough, on landing at Heathrow airport on a gloomy Saturday evening, part of the Piccadilly line that runs to the city was partially closed. I must though, in all fairness, raise a toast to London’s underground network. It’s one of the most extensive systems of the world. 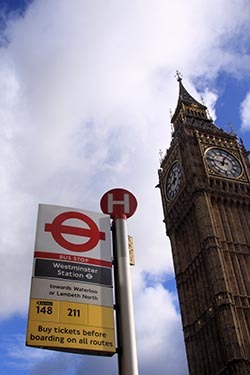 One can virtually go from anywhere in London to anywhere in London. I can’t imagine the life in this city without the ‘tube’. Ordinary mortals cannot always use the London Taxi. They are frightfully expensive. It’s a good idea to buy an Oyster card. That’s the first thing you should do on landing. The card (you can top it up as you go – minimum GBP 5) saves time and money as compared to buying single trip fares. Of course, if you are a tourist and plan to churn the underground and the over ground (buses) then it’s a good idea to buy a travel card. There are 6 travel zones in London. In all probability travel card for zones 1 to 3 should do the trick for you. The fares on weekends and off-peak hours are cheaper. Since the exhibition was at Excel in Docklands area, it made sense to stay nearby. I was booked at Customs House Hotel just next door to the exhibition hall. That saved me at least 2 hours of commute every day. It took me nearly 90 minutes to reach my destination. A combination of 3 underground lines – Piccadilly (change at Acton Town), District (change at Tower Hill) & DLR alight at Custom House). The total cost was just over GBP 5. The taxi would have taken almost the same time and would have cost GBP 60. Custom House Hotel has my full marks for its location. The rooms are clean and the breakfast is hearty. The only flip side is the size of the bathroom… so tiny that you need to have great maneuvering skills to do your cleaning job. The hotel has a nice restaurant. It was early dinner. And early to bed too. We would be doing the tourist thing till tomorrow afternoon before reaching the exhibition hall to put up our booth. That night I (and most of the London residents) prayed for a sunny Sunday. Prays were heard. It was a nice sunny Sunday morning… just the kind of weather Londoners look forward to. The sun would of course play hide and seek till about 4 in the afternoon. That was quite OK for me. What else would a photographer ask for? After breakfast, we (my son Ruchir was with me) took the DLR that took us to Canning Town. From there we took the Jubilee line that took us straight to Green Park station. From now on, it will be walking all around. In fact, the best way to enjoy all things good is walking in the neighbourhood… especially if the weather permits. A pleasant walk through The Green Park brought me to the gates of the famed Buckingham Palace. It was 10:30 AM when we reached the gates. The crowd was full to the brim. Buckingham Palace is indeed the most popular tourist attraction. Thanks to the ceremonial Changing of Guards that happens every day. Since winter had set in, the time for the ceremony was 11:30AM. 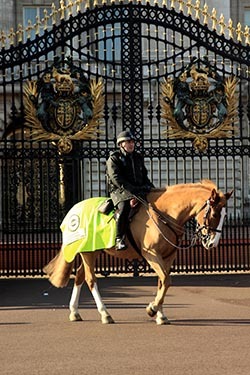 By 11AM, mounted police took over the reins to ensure that the crowds stand at the designated areas. At 11:30 palace guards began to march within the palace premises. By 11:45 various bands, marching proud, arrived from 3 directions and entered the palace premises. Thereafter, it was more marching. Since the crowd who arrived early got the best positions, I could barely see the action that was happening. After some time, the guards were ready to leave and march back to their locations. The tradition has been going on for centuries. The guards are not ceremonial as you might think. They are seasoned soldiers who serve in the British Army. 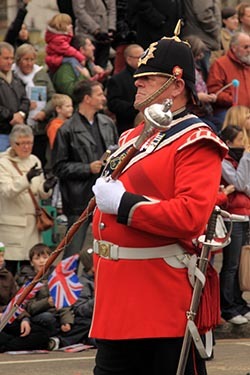 They come from 7 different regiments namely, Life Guards; The Blues & Royals; Grenadier; Coldstream; Scots; Irish and Wales. My next destination would be Parliament Square. Instead of taking the road, I would suggest walking through St. James Park from Buckingham Palace to reach Parliament Square. As compared to other London Parks, St. James Park is small but is very pretty. Walking on the edge of the lake seeing people feeding birds and squirrels is a very refreshing sight. The squirrels of London parks are fat and fearless! 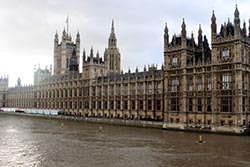 Around the Parliament Square are many London attractions. They include H R Treasury, Big Ben (the clock that made London famous), 10 Downing Street (British Prime Minister’s residence), Westminster Abbey (kings, queens, statesmen, soldiers, poets, heroes, villains… over 3000 people are buried here), St Margaret Church (built in 1523, it’s the Church of House of Commons), Churchill Museum and Cabinet War Rooms, Guards Memorial (erected in 1923 to commemorate the first war of Ypres and other battles of World Wars), Houses of Parliament (Palace of Westminster), Westminster Bridge and River Thames amongst others. A couple of hours just pass by in this fascinating neighbourhood reminding us of our school history books. The buffs could spend days going through every monument. We crossed the Westminster Bridge that offered good views on life of both the banks. 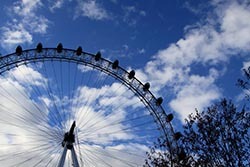 The opposite bank is home to London Eye (a 443 feet giant wheel with 32 glass capsules each holding 25 people offering panoramic views of London), St Thomas Hospital (comes in handy when the rich and the famous fall sick), Florence Nightingale Museum, County Hall and the Aquarium. Walking along this side of the bank is an entertaining experience. Street performers do a thorough job with their acts. An artist disguised as a dog was a real hit. You must see the picture to believe it! After walking for a few hundred meters we took the Hungerford Bridge to cross back Thames River. There are countless bridges as the river almost bisects London. 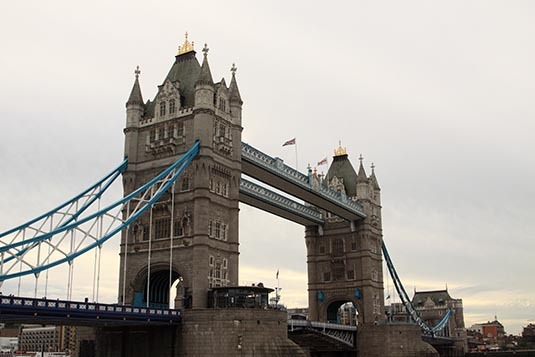 Each bridge has a story… the famous ones being The London Bridge and The Tower Bridge. After crossing Scotland Yard Gate we reached Trafalgar Square – home to Nelson’s Column and The National Portrait Gallery. This square is another major tourist draw. The spacious and paved courtyard, the majestic fountain, St Martin-in-the-Fields Church and other majestic buildings and countless pigeons spice up the flavor. 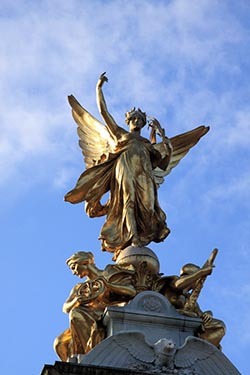 The name of the square commemorates with the Battle of Trafalgar (1805), British Naval victory over Napoleonic wars. Admiral Nelson lost his life in the Battle of Trafalgar. Today, the location is popularly used for political demonstrations and community gatherings. Using the Charring Cross (still considered to be the centre of London from where all distances are measured) road, we reached Leicester Square – arguably the most happening spot in London. Theatres, restaurants, bars, boutique stores, fast food joints, game arcades keep this neighbourhood very, very busy. 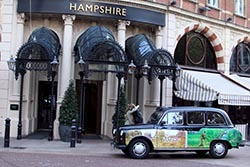 I am told, the nightlife out here is truly amazing as is in its neighbouring area SOHO – more adult stuff there though. From Leicester Square we walked along Regent Street to reach Piccadilly Circus – probably the world’s most well known roundabout. The area is home to England’s finest theatres and opera houses not to forget the famous neon signs. We continued marching on the Regent Street. This is one another London road that is home to world’s finest brands notably National Geographic, Apple (so big it almost resembles a mall), Ferrari and Hamleys (world’s largest toy store; 250 years old) amongst many others. 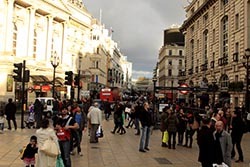 Regent Street meets up with Oxford Street – London’s shopping paradise. Oxford Street is home to Selfridges (world’s largest department store). Amongst others Primark is also out there. This store, I am told, offers value for money as it was apparent with numerous shopping bags I could see on the street. London was preparing for Christmas. The street was truly decked up. Must be quite a sight after dark. We crossed Oxford Street to reach Bond Street station. It was 4PM. We had walked for nearly 5 hours now. It was time to get back and do up out booth. Jubilee line from Bond Street took us straight to Canning Town. Our destination, Custom House, was just 2 stops away on the DLR. The next 4 days (Monday thru Thursday) we were busy at the trade show. On the last day we shifted to Novotel Tower Bridge. As mentioned earlier, there was no point camping at Custom House after the show. Novotel is a fine hotel just a minute’s walk from Tower Hill station. Friday was reserved for business with our partners in our London office. We would leave on Saturday evening thus presenting us with the morning to explore a bit more of London. It was a cloudy morning but thankfully there were no showers. Not an ideal day to take pictures though. After a hearty breakfast began our journey. A few minutes’ walk across the road got us to the famous Tower Bridge. The bridge opens up when tall ships need to cross the Thames. A GBP 7 fee will allow visitors access to the upper level of the bridge that offers a panoramic view. Just so you know Tower Bridge is different from London Bridge. The bridge gets its name since it stands next to The Tower of London – our next destination. In here, the buildings of one of Britain’s finest historical attractions span 900 years. The bastions and battlements house a series of interactive displays on the lives of British Monarchs and the painful deaths of traitors. The Tower of London is home to Crown Jewels (including Kohinoor – the world’s largest diamond) and the Royal Armoury in the White Tower. There’s a fee to visit the Tower of London. You would need at least a few hours to go through. Since time was limited, we skipped going in. Before taking our train from Tower Hill station, we walked past Trinity House (official General Lighthouse Authority for England, Wales and other British territorial waters) another imposing London structure. The District line from Tower Hill got us to Monument. From there we changed to the Central Line that brought us to St Paul’s. In less than 25 minutes we were in front of the majestic St Paul’s Cathedral. Built in the 17th century and standing 365 feet high, the monument is one of the most famous landmarks of London. The imposing cathedral has witnessed many happenings notably the funerals of Lord Nelson & Sir Winston Churchill; Golden Jubilee and 80th birthday of Her Majesty the Queen and the wedding of Prince Charles with Lady Diana. As luck would have it, The Lord Mayor of London Show 2010 was passing by St. Paul’s Cathedral. The parade had hundreds of floats depicting the many facets that touch the English life. After spending about 30 minutes out there, we took the Central Line to alight at Marble Arch. Designed in 1828 on the lines of Arch of Constantine in Rome, Marble Arch is built using Carrara marble in one corner of Hyde Park. It was originally built as a gateway to the newly built Buckingham Palace. Historically, only the members of Royal Family were allowed to pass through the arch in ceremonial processions. Today, commoners hang around. The structure is strategically located at the junction of Oxford Street, Park Lane and Edgware Road. Just across Marble Arch is Hyde Park – the second largest city park in the world - the first being Central Park, New York. Just adjacent to Hyde Park is Kensington Gardens. Water bodies named The Serpentine and The Long Water divides the two parks. 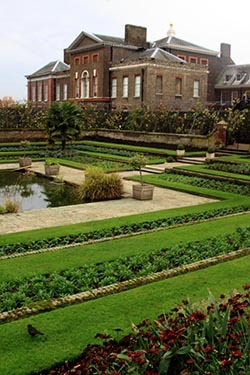 The parks are home to beautiful water bodies, fountains (namely Princess Diana Fountain), cafeteria, galleries, bird sanctuary, Albert Memorial and the Kensington Palace. We entered Hyde Park at about 12 noon. By the time we came out from Kensington gardens it was nearly 3 PM. 3 hours of walking and there was still so much to see. There’s no point me describing the beauty. I think the pictures will do the talking. Just opposite the Albert Memorial stands the famous Royal Albert Hall. Built in 1871, the structure is the most treasured one and recognizable the world over. Since its opening by Queen Victoria, world’s leading artists of every kind of performance genre have appeared on its stage. Each year, over 350 performances happen out here. Its lighting and acoustics are considered to be engineering feats. It was time to head back to the hotel, pick our bags and dash to the airport. We boarded the District Line from High Street Kensington station to alight at Tower Hill. Our trip to Heathrow airport was nothing less than an adventure. Closure of many lines resulted in unbearable loads on the few lines that were working. Packed like sardines, we somehow managed to reach the airport to board our flight back home. Whilst on a business trip to London, I had an afternoon to explore some unexplored locations. Being summer, the light was around and as luck would have it, the sun was up. It was typical English summer. My few hours of walking took me to Covent Garden, Camden Town and Regent’s Park. A settlement has existed in the Covent Garden area since Roman times - the first century AD, when London was known as Londinium. The area around Covent Garden and the Strand was, in the 7th century, a busy Saxon trading port called Lundenwic. Lundenwic was abandoned once the Viking invaders became too dangerous in the 9th century. In 1630 the fourth Earl of Bedford commissioned the architect Inigo Jones to build houses on the site that would be ‘fit for the habitations of gentleman’. Jones had travelled widely and was greatly inspired by the grand Piazzas and buildings in Italy. He created Covent Garden’s Piazza – the first open square in England. It was essentially an ‘experiment’ in town planning as he also designed the perfectly straight grid of streets surrounding the Piazza. Londoners at the time were used to a much more disorganised road system so this was a welcome change. Many of the original street names from Jones’ time survive: King Street, Charles Street and Henrietta Street were all named in honour of Charles I and his Queen. Bedford Street, Russell Street, Southampton Street and Tavistock Street all owe their names to associations with the Russell family. The Lamb & Flag pub on Rose Street is the oldest in Covent Garden. Bare-knuckle boxing fights were staged here in the 17th century with fights taking place on the cobbled front yard and in the back room, which was known as The Bucket of Blood. After the opening of the Piazza in the mid 17th century, stalls of market traders hawking fruit and vegetables became an established feature. In 1670, the 5th Earl of Bedford recognised the business potential and obtained the right to hold a market by Letters Patent from King Charles II. In the 19th century, responding to the rapid commercial growth, the 6th Duke of Bedford started works that would rebuild the market. From 1828–30, the old stalls and sheds were cleared and Bedford commissioned architect Charles Fowler to design and build a neo-classical Market to house fruit and vegetables. The market employed more than 1,000 porters at its peak. In 1858 the beginnings of the present-day Opera House started after the fire destroyed the old one. It was designed by EM Barry who also built the Floral Hall next door. In 1918 a foreign flower market was opened on the south side – now known as Jubilee Hall. Finally, in 1964 an Act of Parliament was passed that would clear the way to remove the fruit and vegetable market at Covent Garden to new premises at Nine Elms after it had grown-out of the Market at Covent Garden. 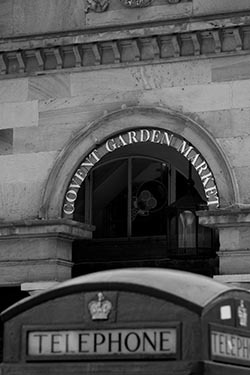 Today, Covent Garden thrives as a destination for shopping, dining and entertainment. Camden Lock Market, by the canal, was the original craft market, established in 1974, but now has a much wider spectrum of goods on sale. Both this and the ever popular Camden Stables Market - centre of the alternative fashion scene, Camden (Buck Street) Market, the recently improved Camden Lock Village and Inverness Street Market - which thrived on local trade long before tourists discovered Camden, are all open every day, making the area well worth a mid-week visit. But it is at the weekend that the market scene jumps fully into life with all stalls and shops at the markets fully trading. The indoor fashion market at the Electric Ballroom opens on Sunday only. 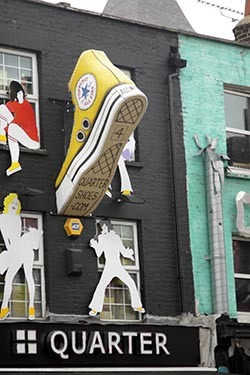 There is always something happening in the centre of Camden Town. Multitudes of shops and restaurants spill out on to the busy Main Streets. Days in Camden start slow and easy - shops and stalls open around 10AM usually until 6PM, although some traders do stay open later. In the evening the theatres, bars, clubs, pubs and restaurants continue to swing until at least 11PM. You may want to check a feature on Camden by Amrihtaa. A short walk from Camden Town, is Regent's Park. Though London has many parks, I would rank this park as amongst the most beautiful. During my visit, the garden was in full bloom. The English Gardens, the Japanese Gardens were all very welcome. 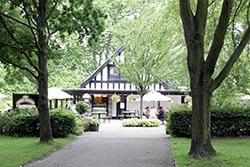 The Regent's Park, I am told is the largest grass area for sports in Central London and offers a wide variety of activities, as well as an Open Air Theatre, the London Zoo and many cafes and restaurants. Henry VIII appropriated The Regent's Park for use as a hunting ground, which he considered to be an invigorating ride from Whitehall Palace. At that time, the only boundaries were a ditch and a rampart. Were he here today, Henry would hardly recognise the stylish gardens and sports fields that now stand in its place. If you have a couple of hours on hand, when in London next, do try to make a short trip to Alexandra Palace. Situated on the north side of London the location gives a panoramic view of London City. I am told that the location is London's highest natural point. Wood Green (on the Piccadilly Line) is the nearest underground station. Once out, hop on to W3 bus and you will be at the Palace doors in 20 minutes. We have an office in the same neighbourhood. When I was there last with my son Ruchir and partner Ramy, we decided to grab a bite at Alexandra Palace. The drive took us just 5 minutes. The sandwich was worth a million dollars. Or should I say pounds? Fortunately, the day was not very gloomy (as most of the time London is). We could see miles ahead. Had it been bright and sunny, I am sure the view would have been just awesome. Behind us was the magnificent Palace, standing proud in its entire Victorian splendor. First opened as "The People's Palace" in 1873, Alexandra Palace provided the Victorians with a great environment and recreation centre. Just sixteen days after it's opening, the Palace, which had already attracted over 120,000 visitors, was destroyed by a fire in the dome. It was rebuilt and later on the site became BBC's first broadcast location. Thereafter, a public trust was formed and ever since the Palace is open, free of charge, for the general public. With stunning architectural features and well proportioned halls, the Palace is now a very popular choice for both corporate and private events. The additional leisure facilities which include the Ice Rink, Phoenix Bar, Boating Lake, Children's Playground, Animal Enclosure and Conservation Area provide year round entertainment for everyone. Once you have done your Big Ben, Buckingham Palace, 10 Downing, Thames cruise… try this one out. You will be delighted.